Best for nominal comparison of individual groups. Shows independence and meaning of each category you have. To create a column chart, from the Layout page, select Bar chart. You need to add at least one measure and one dimension to create a chart. To switch in between column and bar charts, just change the chart orientation. 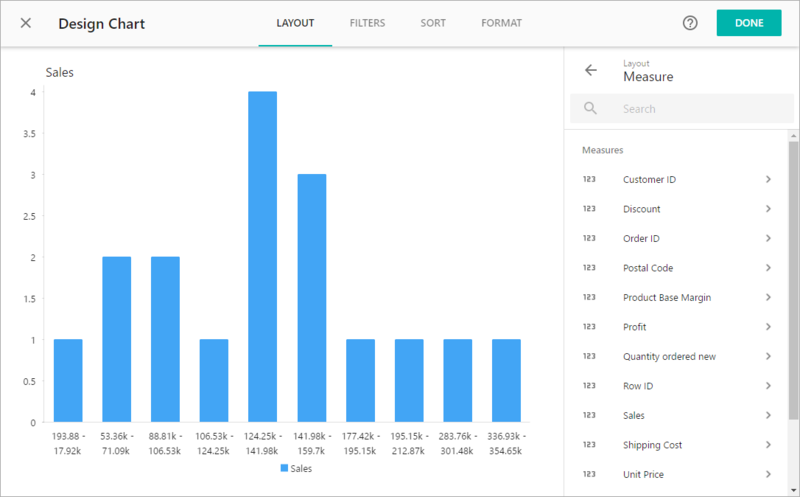 Add a breakdown dimension to series to create a grouped bar chart. 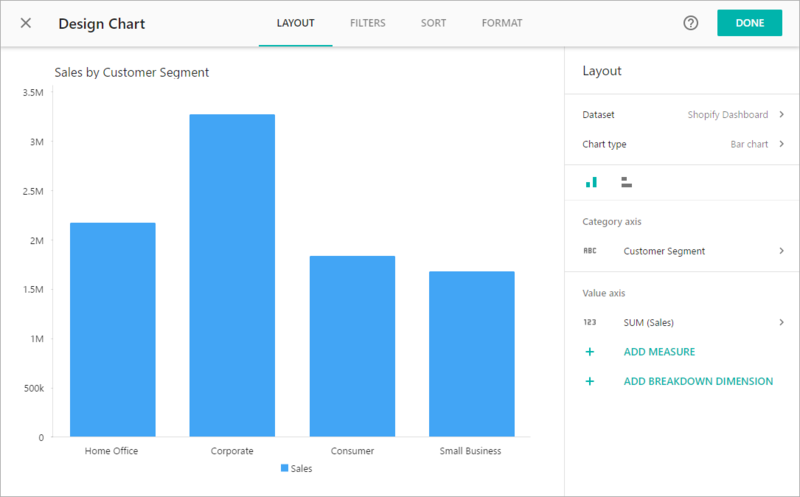 Once you add a breakdown dimension, you can switch over to stacked bar chart or use the percentage bar chart to compare elements as parts of the whole. To create a chart with multiple metrics, add Measure Names to the Category axis, and then check/uncheck the measures in filter. NOTE: If you have no Date dimension in your data source, this chart type won’t appear on the pane. To build a line chart on non-Date dimension type, read the next section in this article. Use timelines to chart time-series or how values change over time. It is a perfect medium to see patterns and trends. Lines are good for nominal comparison of two or more groups when you need to show the relationships between one and another group (order of groups is significant). Also used for showing frequency distribution and deviation of the value in time. 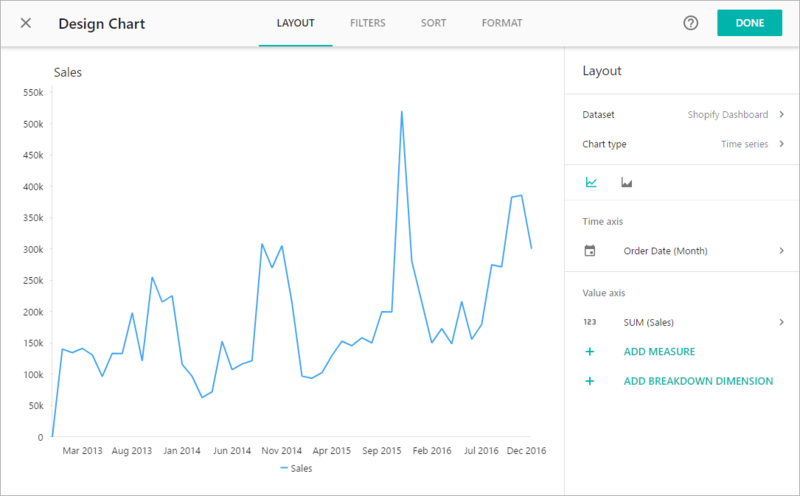 To create a line chart on a Date dimension, from the Layout page, select Time series. 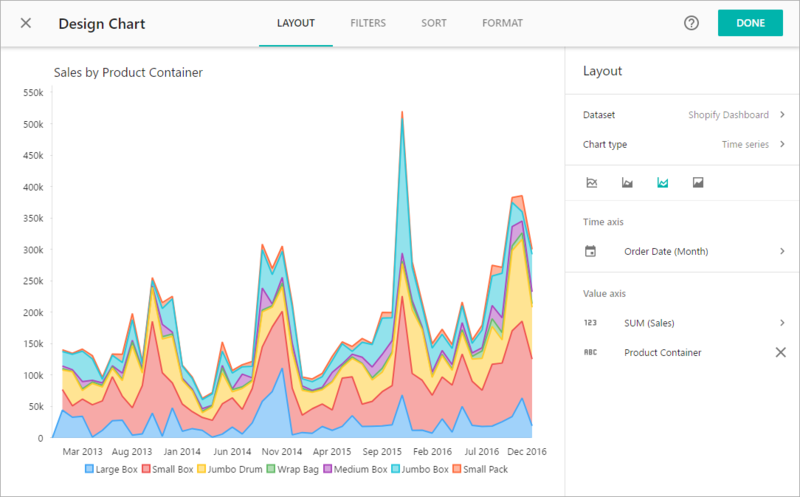 You need one measure grouped by time dimension to build a line chart. Add a breakdown dimension to lines (series) to split the measure. You can switch over to area charts. Similar to lines, place one measure as a value grouped by time. It is helpful in visualizing multidimensional data, especially when stacked. To create a stacked area, use a breakdown dimension. 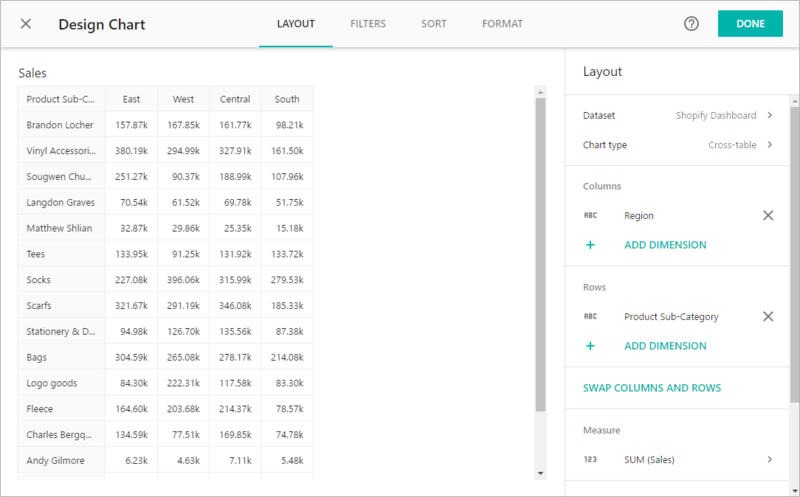 Once you add it, you can switch over to line, area, stacked area and percentage stacked area chart types. Using one of the percentage chart types will allow you to better understand each element as a part of the whole and compare. 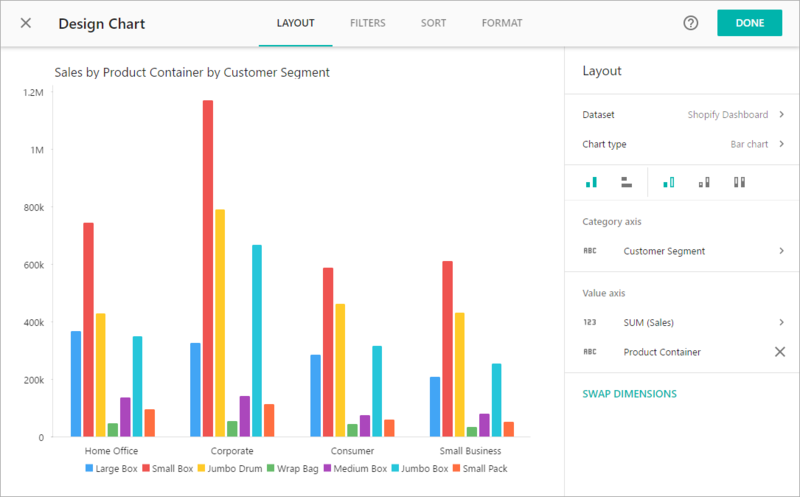 To build a line or area chart, from the Layout page, select Bar chart or Combo. Add at least one measure and dimension. Switch to the Format page. Select Elements > Series, choose the serie, and change the Series type. Combo chart is a chart that lets you render each series as a different marker type. To create a combo chart, from the Layout page, select Combo chart type. Choose a dimension and add as many measures as you need. 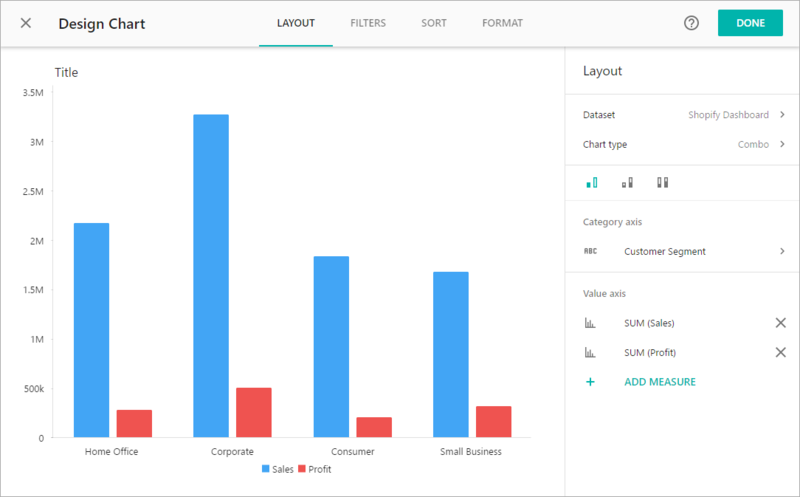 You can also you can switch over to stacked chart or use the percentage stacked chart to compare elements as parts of the whole. Just notice that series with different types will not stack to each other, and markers are not suppose to be stacked at all. 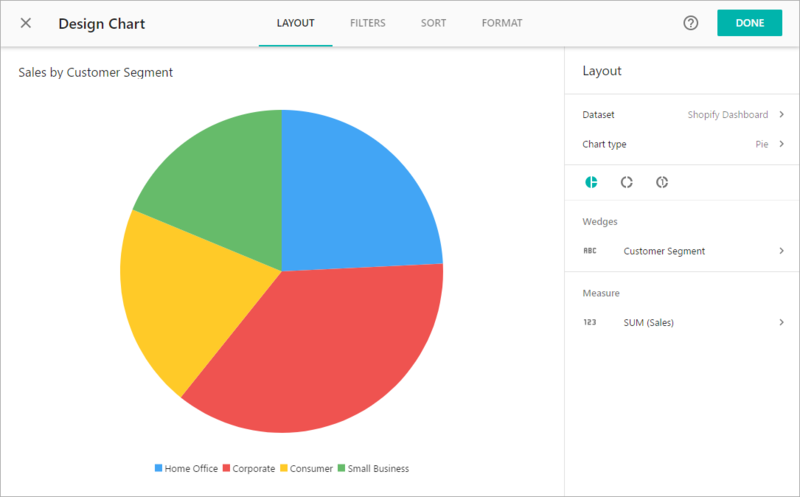 Pie charts can be effective in showing the contributions of data segments as a percentage of a whole. To create a pie chart you need one measure in value and one dimension in wedges. Single value is a measure aggregated and presented as a number. Use it to present totals or current values. To customize/hide this indicator, go to the Format page and select Elements > Change rate. NOTE: For charts based on Google Analytics, Growth indicator will appear only if you apply a one-date-period filter to your chart, such as “today”, “yesterday”, “this month”, “last month” and so on. You can also show the difference from the previous period as a relative or absolute value. Choose gauge or progress bar to compare the featured measure to a related measure (for example, a target or the same measure at some point in the past, such as a year ago). By default, gauge and progress bar show percent difference between values. To show absolute values instead, enable the Show absolute value setting in the Format > Chart menu. 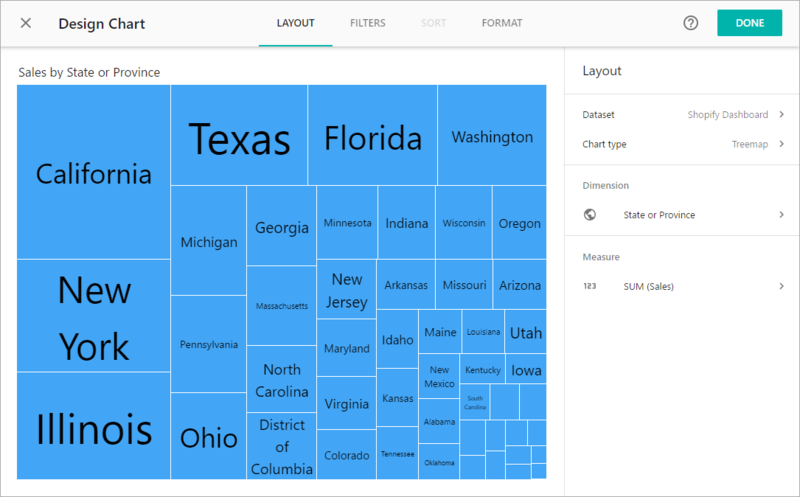 Treemap is appropriate to describe large amount of information especially when you have a dimension with many elements. It is useful to show the whole picture and how groups are related to each other. 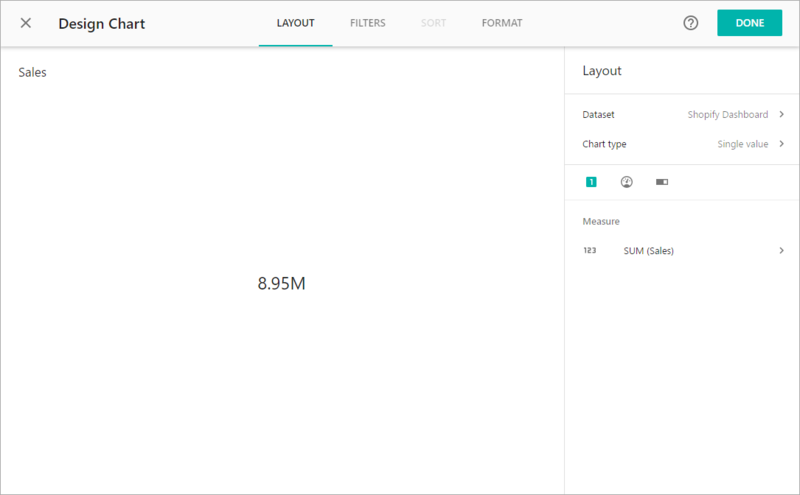 To build a treemap, you need a measure to be subdivided into parts and a dimension by which to subdivide it. You can color groups by dimension, or add a second measure to compare groups within two measures simultaneously. To do this, go to the Format page and select Colors. Use scatter plots to discover correlation – positive or negative, strong or weak. 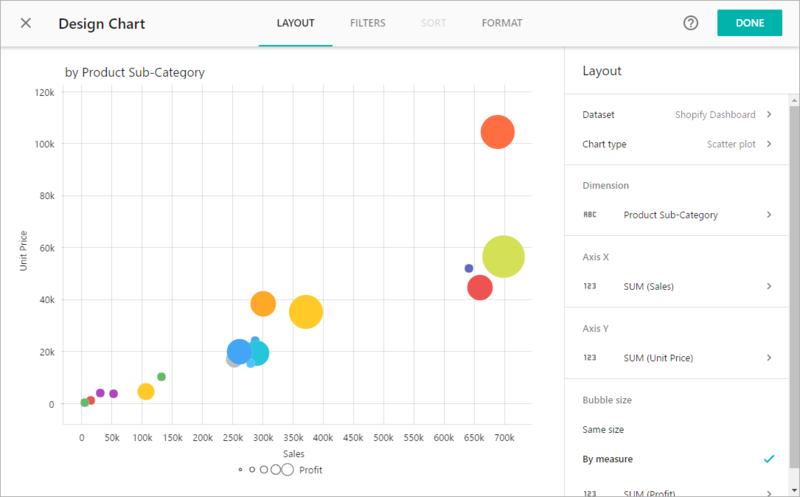 From the Layout page, select Scatter plot under Chart type. You need one dimension as points and two metrics in X and Y axes. Add additional measure as size to dig deeper (Bubble size option). You can also color groups by dimension, or add a second measure to compare groups within two measures simultaneously. To do this, go to the Format page and select Colors. Funnel is used to find bottlenecks in a series of successive steps. It shows you the conversion rate from one step to another. 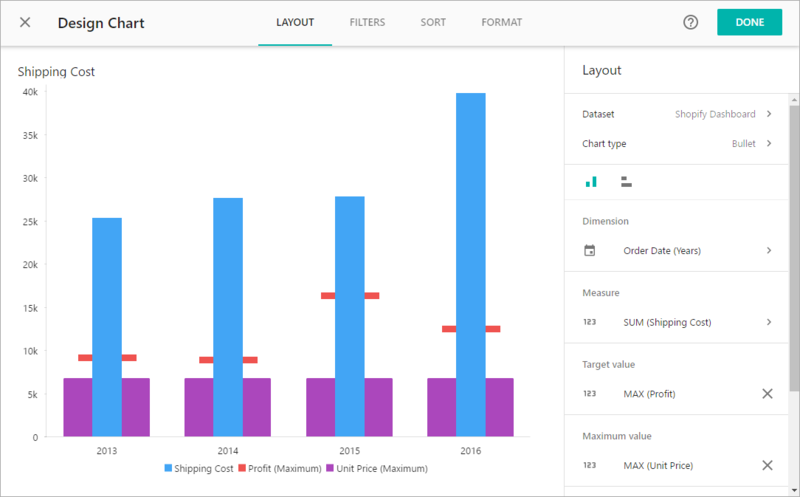 To build the this type of chart, select Pyramid, Single color or Multicolor subtype under Layout page. You can place several measures to Add measure field (order is insignificant) and they will be sorted to show the correlation. Or you can select one measure and define the stages by dimension elements. The best way to analyze large-scale geographical data is the choropleth map. 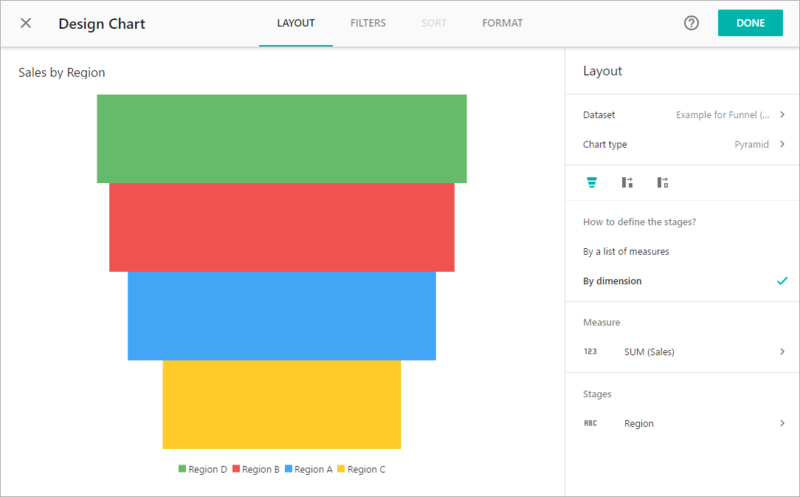 If you have no geographical dimension in your data source, this chart type won’t appear in the pane of the Layout page. 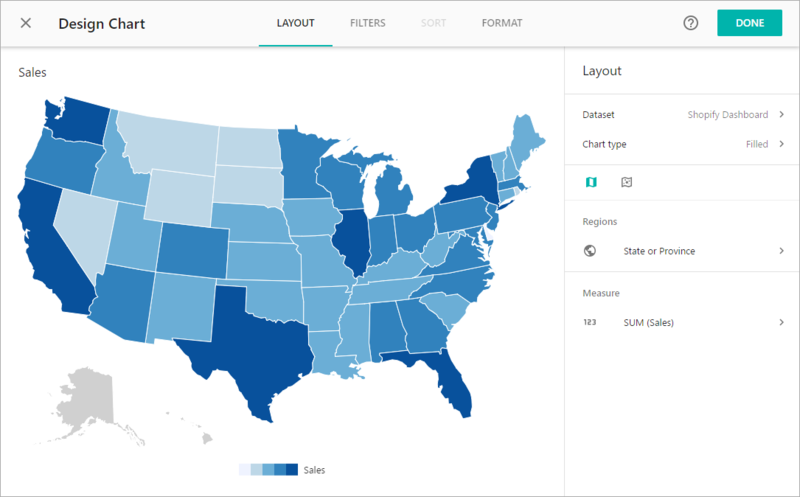 To build a map, you need to specify a geographical dimension in the Dataset editor first. Select a column with geospatial data, go to Type > Geography and choose the appropriate map. There are two levels of maps: country (World map) and state. Region codes (specifically, uppercase ISO-3166-2 codes) or their equivalent English name (for example, US-NJ or New Jersey). You can also build a Google Map with latitudinal and longitudinal data. To learn how to create this type of map, read this article. 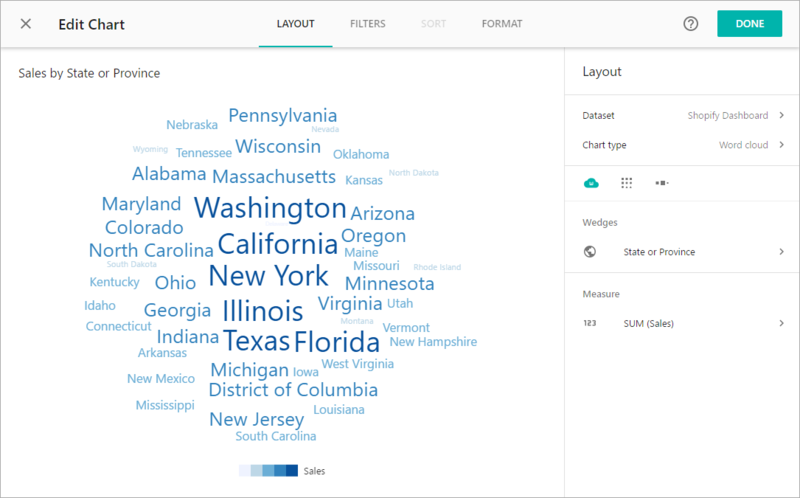 When you have specified the dimension in the dataset, from the Layout page, select Filled or Symbol map type. You need to have minimum one geographical dimension in Regions. Slemma will automatically place a geographical dimension, but you can of course replace it with the one you want if you have more than one. Tables work well if you need to emphasize and compare individual numbers. To display this type of chart, you need at least one dimension and one measure. 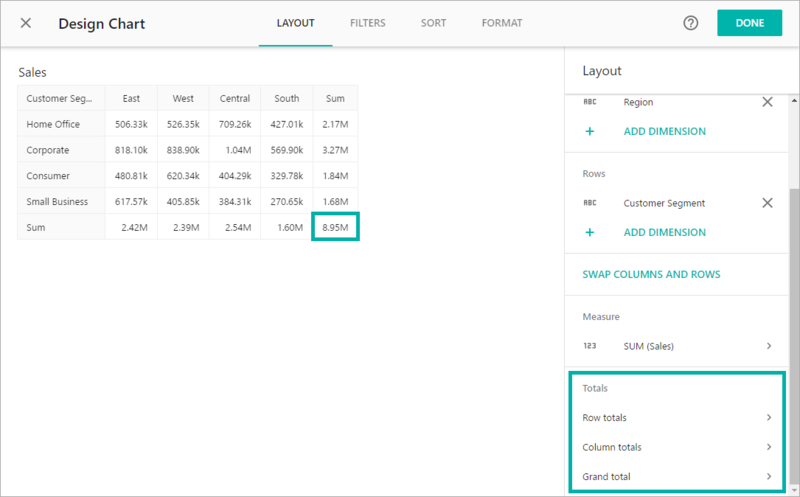 To create a cross-table, you need two dimensions placed in columns and rows. For example, you can see profit by product category and by region. To show several measures in one table, place Measure Names dimension in the columns or rows and add a filter to select only the needed measures. You can add Row and Column totals to your table. For example, you can have a sales table by both region and segment and still get the sum of sales with a totals row. A Grand total option will add both Row and Column totals and give the Grand Total result in the corner. To change the column/row names (actually, to create aliases for columns), go to the Format > Elements > Column headers (or Row headers) menu. Please note that in filters, dimension elements which gave the names for columns, will still have the same names as in your data source. Simple table shows data the way it is shown in your data source (raw data). Calculated measures and aggregation are not supported in this table type. If you change the format of your measures on the dataset level (for example, change numbers to percents, or add a currency symbol), this format won’t be applied to this chart. Add fields (measures and/or dimensions) to create columns. To create this chart, from the Layout page, select Histogram chart type. Add a measure and a dimension to create bars. Measure values will be automatically distributed among bars. Bullet graphs compare the featured measure to one or more related measures (for example, a target or the same measure at some point in the past, such as a year ago) and relate the featured measure to defined quantitative ranges that declare its qualitative state (for example, good, satisfactory, and poor). To create this chart, from the Layout page, select Bullet chart type. Add a measure and a dimension to create columns. Then you can add measures to demonstrate high/middle/low values and target value (for target value, you can also use manual input). Pictorial type is used to represent data comparison visually. Pictorial charts use relative sizes or repetitions of the same symbol to show data relation. 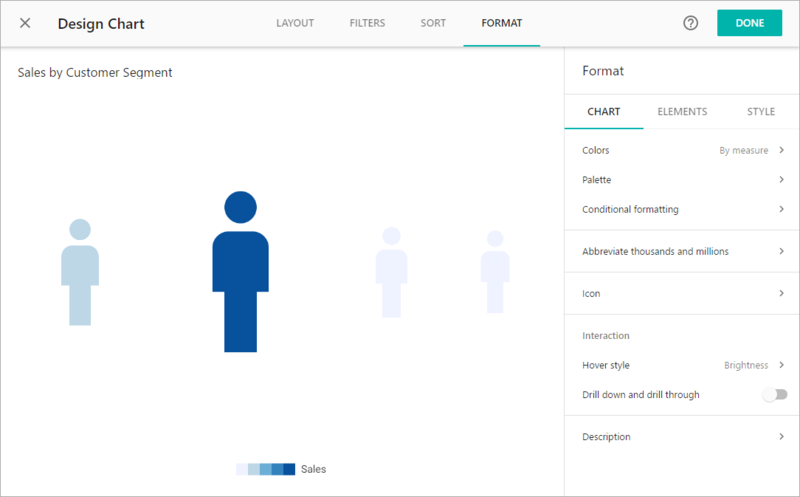 Select the symbol you want to use in the chart, from the Format > Chart > Icon list. You can also select the color. Word cloud is a type of pictorial chart, where the font size of a word depicts the data relation.